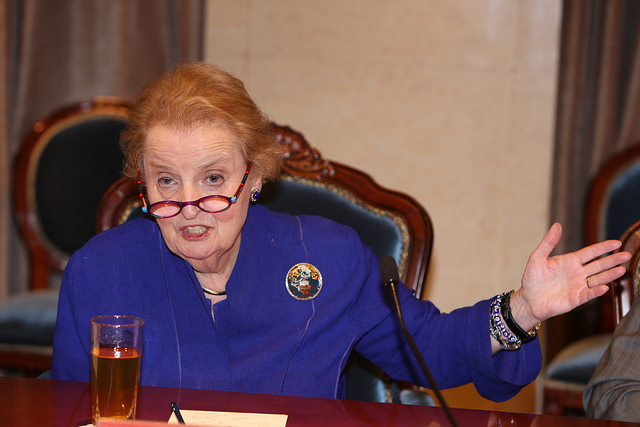 As the summer silly-season scorches across Oz, it’s time for a silly moment with a trace of serious purpose—the Madeleine Awards  for the use of symbol, stunt, prop, gesture or jest in international affairs. This is the sixth annual presentation of the Madeleines, named after the former US Secretary of State, Madeleine Albright, in honour of her habit of sending diplomatic messages via the brooches on her lapel. She wore a golden brooch of a coiled snake to talk to the Iraqis, crabs and turtle brooches to symbolise the slow pace of Middle East talks, a huge wasp to needle Yasser Arafat, and a sun pin to support South Korea’s sunshine policy. Her favourite mistake  was wearing a monkey brooch to meet Vladimir Putin, causing the Russian president to go ape. We start with the two minor awards: the OOPS (I wish I hadn’t…..!) for blunders and bloopers, and then the prize for pictures or images, entitled the Diana Directive on the Utility and Force of Photographs. The OOPS has tended to go to Australian politicians because we take so much pleasure in the accomplishments of Oz leaders. And Prime Minister Tony Abbott has pushed hard to take out the OOPS for a second successive year. He won previously for a mighty effort during the 2013 election campaign. In a moment of modesty he tried to say he was not the repository of all wisdom. What emerged from his lips was: ‘No one, no matter how smart, no matter how well educated, no matter however experienced, is the suppository of all wisdom.’ This was OOPS-winning wisdom. Putin mightn’t know much about Australian Rules, but he understands the use of gesture and gibe on the international stage. Putin’s Madeleine-worthy response while attending the G20 summit in Brisbane was to have Russian warships  sailing around in international waters off Queensland. Thus, the exchange became something like: You call that a shirtfront, I call this a fleet. Neither signal rated as a success. Senator Johnston no longer has the job. He’ll be remembered as the defence minister sunk by a canoe. Most years that would have got him the OOPs. Alas, at the last moment he has been comprehensively out-blundered by a striking international performance—an attempt at comedy that went cyber and became a contest of wills. Step forward—to opposite sides of the stage—North Korea and Sony Pictures . Sony started to reach for the OOPS by making a comedy about a plot to assassinate Kim Jong-un. North Korea responded with a massive cyber attack. Sony surrendered and canned the film; then, pushed by the US President, un-surrendered and released the movie. Sony already has a deep understanding of the various levels of dumb it has achieved. North Korea may eventually comprehend its own dumb achievement, going cyber-psychotic over a dumb movie. A well-earned OOPS to them both. Now to the prize for pictures or images: the Diana Directive on the Utility and Force of Photographs. The title comes via Tony Blair who cited  the Princess of Wales: ‘As Diana used to say, the picture is what counts.’ Many a minder has made or sunk a career on that simple bit of advice—the picture defines the story. Politicians in trouble must avoid Exit signs and stand in front of the flag. 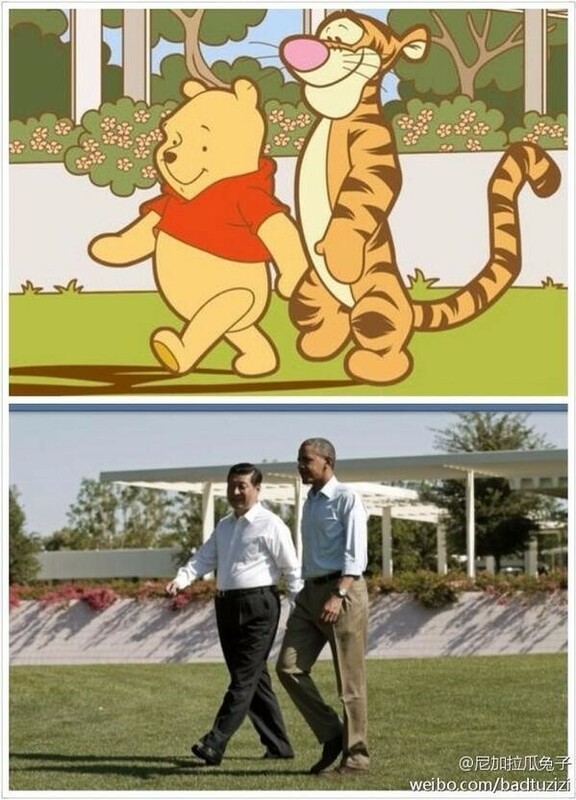 Here is last year’s Diana winner, which trended on Weibo; masterful because so many interpretations are possible. 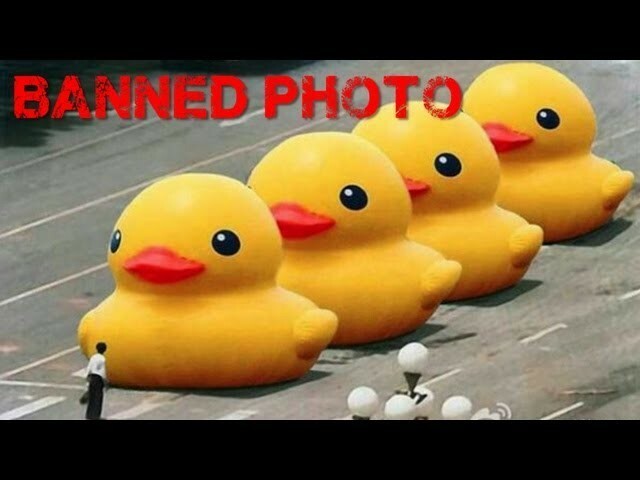 And this year, the Chinese censors went close to winning because they got so scared of viral images of a giant yellow duck . Using more than 2,500 technicians, they launched a campaign of daily hologram shows. These brought Mr Modi, in shimmering 3D, live to 1,300 locations and an estimated 7 million people over 12 days. The candidate as crowd-pleasing hologram. Brilliant. The next US election  will come in 3D. The Diana prize goes to the shimmering Mr Modi. The next column will announce the victor of the main award: the Madeleine. Graeme Dobell is the ASPI journalist fellow. Image courtesy of Flickr user Wellesley College .